It's time for another installment of Thursday at the Polls, the feature where you decide the right answer to Pittsburgh's hot button sports questions. As you can see from the photo above, the results aren't always so crystal-clear. 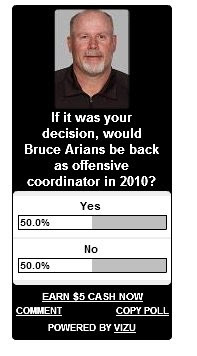 Mr. Arians proved to be quite the divisive force in our last poll. With that as the primer, here's a new batch to mull over. And remember, vote responsibly. Hate the Maz statue question. Who is really going to start going to games to see a statue? The statue is to honor a great former Pirate, and I can't believe you'd use this as another reason to pile on the Pirates. Come on, this is one of the only blogs in Pittsburgh that actually gives a crap about the Pirates. The question is a valid one if only for the fact that a lot of people have raised it since the announcement. That said, I think honoring Maz is LONG overdue and even if they just won the world series, I would want them to build this statue. The Pirates statue is not a distraction -- however -- it's a sad reminder of how great a team they used to be and will probably never be again. Maybe before we're all dead, they can actually build a statue to a player who once played at PNC Park. Can't go wrong with most of those Steelers statues if made. I'd prefer either a Bradshaw with his finger in the air after Super Bowl 13, A Franco picking up the Immaculate Reception, or a toothless snarling Lambert. A steel curtain could be cool if done right, but it would be pretty big. Steve, there is already a full color statue of Franco catching the Immaculate Reception at the airport. It's pretty cool looking, and whenever you land in the 'Burgh it's one of the first things you see as you proceed to baggage claim. Here is one that wasn't mentioned and maybe it's too soon, but what about when Ben tackled Nick Harper against the Colts in '05? The statue is a tribute to the World Series we won 50 years ago and a reminder that it will be at least 50 more until another one. I dunno Burress I think it's a tribute to one of the team's greatest players. I mean the guy won two world series, was an absolute force at second base even inventing two or three defensive methods considered text book today, wasn't a bad hitter in his own right, and oh yeah, won the team a world series. Is the statue a distraction? Yeah, probably, but is it some sort of tribute to a World Series they won and a coded admittance that they aren't going to win again in our lifetime? Come on dude, that's a little much. Yeah, I heard about the Franco statue at the airport but neve saw it, as I haven't had to fly into P'burgh in over 12 years. Oh there's nothing "coded" about the statue at all. It will be a nice tribute to a time and player we will never see again and honestly, it has about as much in common with this Pirates team and ballpark, as OJ Simpson has with Jessica Simpson, so it would be just as appropriate to put it out at the airport with Franco. Thanks for bringing the Polls back!! The Maz statue is a valid question if for nothing more than it's almost 50/50 in votes. I think the point is trying to separate Maz deserving a trophy vs. ownership actually being totally genuine in their motives of providing it. As for Steeler statues, I love the front four one (Damashek idea, right? ), but think there should be a huge billboard at the airport with WELCOME TO PITTSBURGH and James Harrison's slamming of a Browns fan in the 2005 season. I did not mean to slight Maz and his career. He is certainly deserving and I can see how my comment didn't illustrate my feelings as such. .260 average, but forget that he had over 2,000 hits and 138 HR, which was probably a lot of offense for a 2nd baseman at the time.